Your hosts Stan and Julieanne will provide you with a great fishing experience. We will provide you with overnight accommodation, lunch, dinner or cut lunch. These trips are extremely popular and bookings are essential for accommodation and restaurant. There is so much to see and do in and around Coromandel Town. The fishing is great and in-season scallops are a delicacy. There are many miles of walking tracks and native bush. As one of the original New Zealand gold mining sites there is much gold mining history in the area, including a working museum. Coromandel is renowned for its gardens and also the arts and crafts in the area. A "must see" is Driving Creek Railway with its pottery and amazing railway. We are within 45min of Colville, Matarangi, Kuaotunu and Whitianga so you have the best of both sides of Coromandel Peninsula. 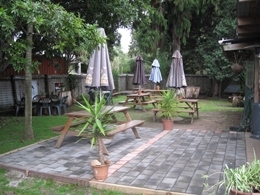 Base yourself at Coromandel Hotel Top Pub, see the peninsula, do some fishing and enjoy dining and fine hospitality.